Not bad for a little hybrid. We’ve been together since December 2005, and I’m still averaging about 30,000 miles/year. Now that I live farther from everything my motorcycling takes in the extra 5-10,000 miles annually I’ve added to my life. I didn’t snap a photo of mariss and his “the man” haircut, but it is totally his birthday RIGHT THIS SECOND and he is awesome. #31! I drove out to pgh for his party — because of my crazy traveling and general sleepiness, I decided to go to bed early on friday after daddy-o dropped off my stuff from gramma’s, and then I got up at 3ish and started driving by 4. I got out to pgh in a solid 6 hours (mpg – 55.9). I had lovely ethiopian lunch with mariss and kelly and serena and then a very fun party and this morning was tasty latvian breakfast and knitting with kelly and then food co-op and the drive home, which took just over 6 hours, but then, there were 30 min. of traffic around allentown (they will NEVER finish that road construction). I got a total trip mpg of 59.9 so I think my mpg on the trip home was about 65 mpg. as I was going faster on the way home than the way out, I can only assume that it’s all downhill from pgh to nj. 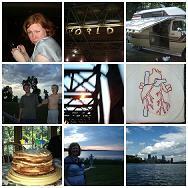 very very good weekend. I was pretty interested when I read about the slate/treehugger green challenge (slate here and treehugger here), wherein one attempts to shave 20% off of ones carbon emissions. I mean, I know I have pretty low carbon emissions. I was so excited after seeing an inconvenient truth that I set about off-setting my driving emisisons with a 12,000 lb CO2 terrapass. I bought green electricity – now 100% of my electricity is coming from NJ wind and solar. and I drive a hybrid! that gets roughly 65 mpg! I’m not even getting into how I’ve alreday changed all my lightbulbs into efficient compact flouresent bulbs, and how I have to wait for my living room to “warm up” after I flip the light switch before I can really see things clearly.The slate/treehugger quizzes seem to assume that you’re not doing so great. I took the first quiz and had to pretend like I had a dishwasher. there wasn’t anywhere to say I was using a hybrid. so I came out with annual emissions of 15,706 lbs, which is not so bad when compared to the US average of 44,312 (and not so good when compared to india at 2,645). but the difficult part came next, where I took the transportation quiz and was asked to pledge to check my tire pressure monthly (it’s easy when you have tire minders), buy a terra pass (check!) for my car, buy one for my flights (was planning on it anyway – am not sure if I should go international at 7,500 lbs CO2 or frequent flyer at 15,000 lbs – it all depends on if I go to england in addition to heading to japan), and then comes the hard question: do you promise to trade in your car for a hybrid in the next 6 months? well. they don’t know if I have a hybrid, they just know I get 65 mpg. the estimates they use say that “driving a hybrid reduces CO2 emissions by more than 10K lbs a year, assuming you currently drive a car that gets average mileage”. which. well. I don’t. I had better not tell them I’ll trade in my *cough*hybrid*cough* because then the calc works out to me reducing another 17K lbs, and that is more than I am supposedly currently using. sadly, my busy engineering lifestyle precludes me carpooling or taking the train to work. sigh. so far, then, I’ve reduced another 1,050 lbs CO2 by telling slate what I have already done. which isn’t so shabby, I guess: if the goal is 20% of total I’m already 1/3 there with 6.6%. the topics for reduction they’ll look at are transportation, heating, food, clothing, electricity, holidays, water, and home/office. y’all should sign up! it’s interesting! dealer: what kind of car again? me: it’s the hybrid insight. dealer: oh, wait, you say it’s a hybrid? dealer: you mean the civic hybrid? me: [eyes rolling, veins popping] um, no, there’s another hybrid: the INSIGHT HYBRID. I decided to give another dealer a shot. 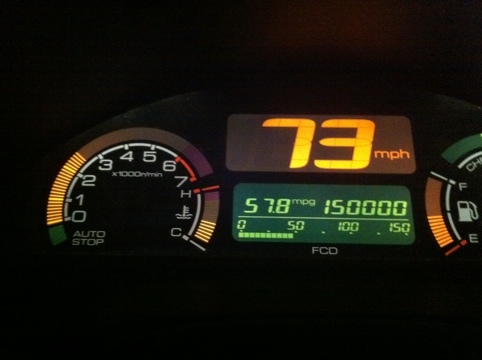 Today I went to garden state honda for my 15,000 maintenance (can you believe I’m at 15,000 miles already? I feel like I just got the car!). It was a lot better than metro honda in two respects: they knew what a hybrid was (when I asked if they had any insights in regular service they said maybe one other, but 10-20 hybrids total – compared to metro honda’s answer of “oh, yeah, we got some”) and also, they actually LISTENED to me. like, the guy brought the honda standard torque wrench out to show me and reassure me that metro honda couldn’t have messed up the very expensive magnesium alloy oil pan by over-torquing. So, that’s in their favor. not in their favor is how they realized after finishing the oil change that they didn’t have the correct air filter so they THEN drove out to get one, making my visit in the very comfortably appointed waiting room last from 7:30 AM to 11AM. at least there were freshly baked cookies, and also, the internets for email checking. the experience was slightly mitigated by a slight discount on the bill and also their extreme embarassment. well! I guess that’s that. I hope they start to send me coupons, because I’m for sure getting my engine work done there from now on. they’re closer, they open 30 minutes earlier in the morning, and they don’t treat me like a girl who doesn’t know anything about her car. and cookies. and internets. did I mention? this morning my lifetime mileage was at 54.5 and my trip (current tank of gas) was at 60.1. I know if I drove slower I would get way better mileage, but, well, I’m just not very good at that sort of thing! I’ve noticed that in the past we’ve had difficulties communicating. Sure, maybe it was just me, maybe I was being too demanding when I kept calling trying to find out when my car was coming in. I was just, you know, *worried* that the car wouldn’t come in before the end of the year. My feelings were hurt when you quit returning my calls, Metro Honda, but I thought we got past that when I forked over $20+ grand. So now, dear Metro Honda, I find us having the same poor communication problems. I know that this is all very new for you. I AM your first Insight driver, and potentially your first hybrid car owner at all, despite the pretty reassurances you’ve given me. But I’m concerned, dear, that you don’t respect me. I’m concerned that you’re not willing to really grow with me, to grow in our relationship. 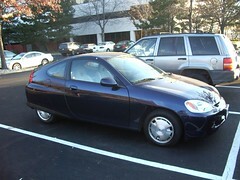 Again we miscommunicated when I brought in the Insight for it’s first maintenance at 7,500 miles. Instead of an oil change and tire rotation, I got an oil change and a talking to. I know, Metro Honda, that you have a lot of experience with other cars. But I read the manual, and I am concerned you’re not really worried about what’s best for me and the baby. If you say I should change the oil every 3,750 mi, how does that reconcile with the recommended change of every 7,500? why didn’t you look at the service requirements for MY CAR instead of relying on what you *thought* ought to be done? When will my poor tires be rotated? What hurts the most, Metro Honda, is that I just don’t think you treat me right. When I questioned why I should follow the “severe driving conditions” maintenance schedule you poo pooed me with several bad arguments. It’s the stop and go nature of the area, you said! it’s the wild fluctuation in temperatures that we get, ranging from a frosty below 32degF to a steamy above 90degF! And what about the SMOG? I was so shocked that you’d think my driving was severe that all I could do is respond: I don’t drive stop and go, unless I’m going to your place during rush hour. I think that the temperature range you just described is AMERICA. and SMOG? that doesn’t affect motor oil! it’s a closed system! I don’t know, Metro Honda, is it me? is it because I’m a GIRL? am I not the man you’re looking for? Is it that I am too confident and well-informed to be the kind of girl you’re looking for? Should we have a special date night where I go over my cars requirements with your technicians? because on the one hand, you seem to want to see me twice as often as required by asking me to come in for severe conditions maintenance. But on the other hand, are you just into me because of my wallet? I don’t want to get petty here, but you should know that I had to reset my own maintenance required indicator light today. Oh, Metro Honda. I’m not sure where we can go from here. Should I start hanging out with Garden State Honda? Is that what you want me to do? I hope we can hash some of this out when I go back next week and force an uncomfortable situation by asking you to rotate my tires.